Recall 128663 started on 10/16/2018 by MFR effecting 847 units. Summary: Streetcar ORV LLC (Streetcar) is recalling certain American Expedition Vehicles (AEV) 3" Dualsport aftermarket suspension kits, part numbers N0436000 and N0436001, sold for installation on 2013-2018 RAM 2500 and 3500HD trucks. Improper installation and machining of the original equipment steering knuckle may weaken the joint between the steering drag link and knuckle. Consequence: The weakened connection may result in a fractured steering drag link, causing a loss of steering and increasing the risk of a crash. Remedy: Streetcar will notify owners and dealers will inspect and install a new steering knuckle, free of charge. The recall began December 3, 2018. Owners may contact AEV customer service at 1-248-926-0256, extension 500. Recall 133399 started on 12/21/2017 by MFR effecting 61,791 units. Recall 127892 started on 12/20/2017 by MFR effecting 1,482,874 units. Recall 130258 started on 09/12/2017 by MFR effecting 443,874 units. Summary: Chrysler (FCA US LLC) is recalling certain 2013-2017 RAM 2500, 3500, 3500 Cab Chassis, 4500 Cab Chassis, and 5500 Cab Chassis vehicles, equipped with Cummins 6.7L Turbo Diesel engines that have Concentric-brand water pumps without a vent hole. These water pumps may leak coolant. Consequence: The leaking water pump can increase the risk of an engine compartment fire. Remedy: Chrysler will notify owners, and dealers will replace the water pumps, free of charge. The recall began February 26, 2018. Owners may contact Chrysler customer service at 1-800-853-1403. Chrysler's number for this recall is T51. Recall 130805 started on 08/10/2017 by MFR effecting 1,765 units. Summary: Streetcar ORV LLC, dba American Expedition Vehicles (AEV) is recalling certain 2013-2017 RAM 2500 and 3500 heavy duty trucks, modified by AEV to be equipped with cast aluminum Katla 8.5" road wheels. The outer surface of the wheel may fracture, resulting in rapid air loss. Consequence: If the wheel fractures, a loss of vehicle control can occur, increasing the risk of a crash. Remedy: AEV will notify owners, and dealers will replace the wheels with wheels of similar value, free of charge. The recall began on August 30, 2017. Owners may contact AEV customer service at 1-248-926-0256 extension 500. Recall 122856 started on 10/13/2016 by MFR effecting 74,811 units. Summary: Chrysler (FCA US LLC) is recalling certain model year 2011-2014 Dodge Charger Police vehicles, 2007-2013 RAM 3500 Cab Chassis, 2008-2013 RAM 4500 and 5500 Cab Chassis, and 2013 RAM 2500 and 3500 vehicles. The affected vehicles have a 220 amp alternator that may suddenly fail. 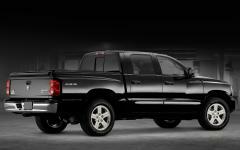 Remedy: Chrysler will notify owners, and dealers will replace the alternator with a revised alternator, free of charge. The recall began on December 23, 2016. Owners may contact Chrysler customer service at 1-800-853-1403. Chrysler's number for this recall is S68. Recall 112069 started on 05/16/2016 by MFR effecting 345 units. Recall 111260 started on 08/26/2015 by MFR effecting 149,080 units. 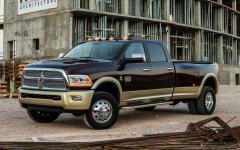 Summary: Chrysler (FCA US LLC) is recalling certain model year 2014 Ram 2500 trucks and 2013-2014 Ram 3500 trucks and cab chassis manufactured October 9, 2012, to July 29, 2014. The affected vehicles may have inadequate welds securing the front track bar frame brackets, which may result in the bracket components separating from the frame. Consequence: If the bracket components separate from the frame, the vehicle may be more difficult to steer and control, increasing the risk of a crash. Remedy: Chrysler will notify owners, and dealers will inspect and install a reinforcement bracket over the front track bar bracket. This recall began on February 24, 2016. Owners may contact Chrysler customer service at 1-800-853-1403. Chrysler's number for this recall is R46. Recall 110611 started on 07/23/2015 by MFR effecting 1,416,903 units. Recall 118011 started on 07/22/2015 by MFR effecting 667,441 units. Recall 118012 started on 07/22/2015 by MFR effecting 667,441 units. Recall 118426 started on 07/22/2015 by MFR effecting 1,059,444 units. Recall 113879 started on 10/08/2014 by MFR effecting 315,325 units. Summary: Chrysler Group LLC (Chrysler) is recalling certain model year 2010-2014 Ram 2500, 3500, 4500, and 5500 trucks manufactured March 27, 2009, to September 5, 2013. In the affected vehicles, the electrical connectors of the diesel fuel heater may overheat. Consequence: If the connectors overheat, the fuel heater may leak fuel, increasing the risk of a fire. Remedy: Chrysler will notify owners, and dealers will replace the harness side connector with a silver plated beryllium copper terminal service kit, and inspect the fuel heater for leaks, replacing it as necessary, free of charge. Chrysler issued interim notification to owners on December 8, 2014. The recall began on April 27, 2015. Owners may contact Chrysler customer service at 1-800-853-1403. 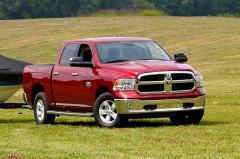 Chrysler's number for this recall is P65. Recall 113880 started on 10/08/2014 by MFR effecting 315,325 units. Recall 96381 started on 06/04/2013 by MFR effecting 17,411 units. Remedy: Chrysler will notify owners, and dealers will reprogram the Central Body Controller software, free of charge. The recall began June 27, 2013. Owners may contact Chrysler at 1-800-853-1403. Chrysler's recall campaign number is N35. Recall 96491 started on 06/04/2013 by MFR effecting 1,069 units. 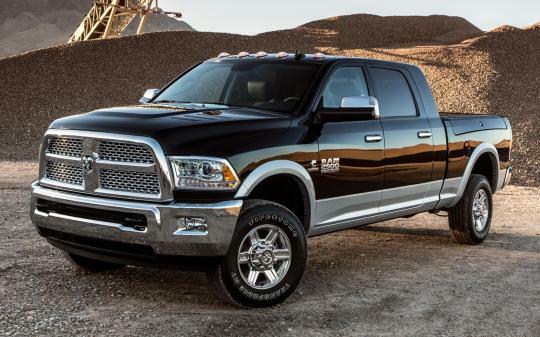 Summary: Chrysler is recalling certain model year 2013 Ram 2500 and 3500 trucks manufactured January 7, 2013, through February 28, 2013 and equipped with optional premium headlamps. The headlamp shutters may function improperly when in high-beam mode. Thus, these vehicles fail to conform to the requirements of Federal Motor Vehicle Safety Standard (FMVSS) No. 108, "Lamps, reflective devices, and associated equipment." Consequence: Improper headlight shutter function during high beam use may reduce the drivers visibility and possibly blind oncoming traffic. Either condition may increase the risk of crash. Remedy: Chrysler will notify owners, and dealers will reconfigure the Central Body Controller, free of charge. The recall began July 30, 2013. Owners may contact Chrysler at 1-800-247-9753. Chrysler's recall campaign number is N33. Recall 97021 started on 04/03/2013 by MFR effecting 6,143 units. Summary: Chrysler Group LLC (Chrysler) is recalling certain model year 2013 Dodge Ram 2500 and 3500 trucks manufactured January 7, 2013, through March 6, 2013. The engine cover may trap an excessive amount of heat under the cover. Consequence: The excessive heat under the engine cover may result in an under hood fire. Remedy: Chrysler will notify owners, and dealers will replace the existing engine cover with one that is a different design, free of charge. An interim letter was mailed on May 31, 2013. A second letter was mailed to owners with instructions on how to obtain the free remedy on August 15, 2013. Owners may contact Chrysler at 1-800-853-1403. Chrysler's recall campaign number is N19.